Evening Loverlies! 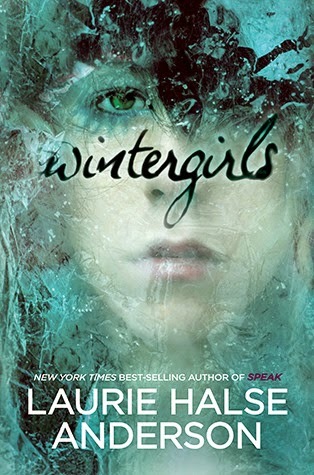 I finally rented Wintergirls by Laurie Halse Anderson at the library. I've been looking at this book in stores for a while and thought to myself I need to read this book. The name of the book and the cover seemed inviting. I'm going to just assume now that most of her books are about any kind of struggles. This book is emotional, very emotional. It talks about a girl named Lia, struggling with anorexia and mental issues. A very sad story, which I don't believe I will be reading again. For me this is just a one time read. The book was easy to read, I will admit it was hard to put it down. The author kept me interested with her words, and I was aching to see if Lia would make it to a happy ending. The way Anderson has written this book really helps you get into Lias' head. Almost as if you were the character struggling. Have A Blessed Day! “Dead girl walking”, the boys say in the halls. “Tell us your secret”, the girls whisper, one toilet to another. I am that girl. I am the space between my thighs, daylight shining through. I am the bones they want, wired on a porcelain frame. Lia and Cassie are best friends, wintergirls frozen in matchstick bodies, competitors in a deadly contest to see who can be the skinniest. But what comes after size zero and size double-zero? When Cassie succumbs to the demons within, Lia feels she is being haunted by her friend’s restless spirit. In her most emotionally wrenching, lyrically written book since the multiple-award-winning Speak, Laurie Halse Anderson explores Lia’s descent into the powerful vortex of anorexia, and her painful path toward recovery.